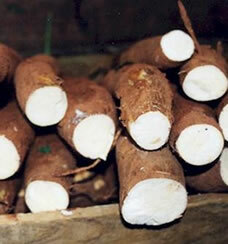 A starchy substance extracted from the root of the cassava plant. Tapioca granules/flakes/pellets are used to make tapioca pudding and to thicken pie fillings. The grains don't dissolve completely when cooked, so puddings and pies thickened with them end up studded with tiny gelatinous balls. If you don't mind the balls, you can also use tapioca to thicken soups, gravies, and stews. If the balls are a problem, just pulverize the tapioca in a coffee grinder or blender, or buy tapioca starch, which is already finely ground. Tapioca tolerates prolonged cooking and freezing, and gives the fillings an attractive glossy sheen. Tapioca is naturally low in sodium, containing only 2 milligrams per 1-cup serving. According to Colorado State University Extension, the majority of Americans consume too much sodium every day, increasing their risk for cardiovascular disease. Though commonly associated with milk products, tapioca also offers calcium. The mineral is imperative for strong, healthy bones and reduces the risk of osteoporosis and bone fractures. For those with lactose intolerance, tapioca is a great alternative for achieving calcium needs. Though people tend to desire weight loss before weight gain, some underweight individuals may have trouble accumulating pounds. Several health conditions may hither individuals to gain weight while some athletes may be trying pack on "healthy" weight without increasing processed, energy-dense foods. Since tapioca is naturally calorically dense on its own, its use can enhance overall total calories without added oils and sugars. Child born with birth defect can be traumatic for parents, so preventing it is essential, if possible. Tapioca contains a significant amount of B-complex vitamins, including folic acid, which has been directly connected to reducing the chances of neural tube defects in infants.